Hello, sir. 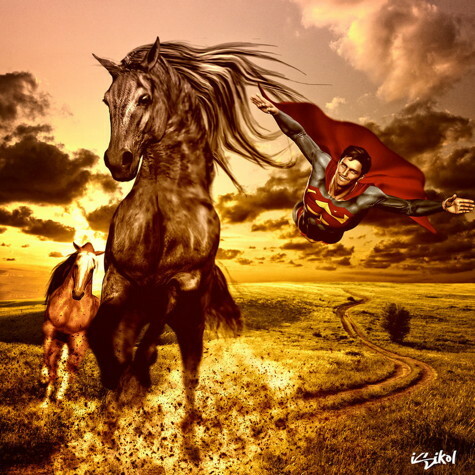 I’m a fan of Superman and a digital artist…I just wanted you to thank you for Superman: Secret identity. The story that you wrote is certainly the best Superman story ever told. You were so inspiring to me that i made a picture out of your writing. This one is dedicated to you, sir. And thank you, Isidore, for the very kind words, gorgeous illustration! Anyone who wants to see it full size can check it out at Isidore’s DeviantArt page, along with the other cool art he’s got there. Nice stuff! I’ve liked Astro City: The Dark Age (though to be honest, I much preferred the brilliant in-between specials, and I’m really looking forward to more done-in-one stories) but there’s one thing that is driving me crazy: The redacted original proposal in the back of the last issue. I am a big fan of BTS stuff like that, and it was a nifty extra. Still, I’ve been thinking about it for weeks now, and although I think I got most of the Marvel references, there’s some I can’t make out. Mostly in issue 4, I’ve not been able to guess what are you talking about in the first paragraph, who “the new *******” or which big story is happening alongside the climax. In any case, thanks for the cool stuff, and keep it up. Sorry, Peter, but if we were going to tell you what was behind those black markings, we wouldn’t have blacked them out in the first place. I will say that we diverged so far from the original plans by then that there really isn’t much left underneath—the first three books are very different from what they’d be if I’d done the story at Marvel, but the fourth one is even moreso. I apologize if it kept you from sleeping. That wasn’t our intent! Just a note to say that I finally got to read Power Company. I wasn’t sure what to think of it when I first saw it. I was afraid it would be like many books put out by the big two where they seem like they want to try something new but end up being very gimmicky. It reminds of some of the group books I liked back when… similar to early JSA, and independents like Sentinels, Crusaders and DNAgents when I was growing up. It has what I love; character development, action and actual thought behind what makes the superheroes super in their powers as well as psyche. It involved it’s own mythos, yet interacted with the DCU. If you can take this the right way, it’s almost good to have it be a shorter run, like a tasty morsel. But I hope to see more of the characters if possible So, thanks for doing it! Very glad you liked it, sir. Hi. I have recently finished reading all the Astro City comics. I never read them all until now. I am sorry that I waited this long to do so. I love your stories, and characters. Please continue this great work. I like the storyline of Royal and Charles Williams. That’s my favorite. I have been working on a project of my own. It is a superhero story. I don’t want to tell more because the story means a lot to me. I would like to know if someday I could pitch the idea to you. I know for a fact that you would appreciate the story. I would like to know what would be requirements to pitch the idea and who to contact. I wanted to talk to you first because of the stories you write. Any help would be appreciated. I am looking forward to hearing from you. Thanks for your time. I’m thrilled you liked Astro City so much. But alas, I’m not the right guy to pitch stories to. I’m a writer. I don’t buy stories from other people. I sell them. So in the first place, I’m not the guy to pitch stories to because I can’t do anything with them. I have tons of my own story ideas, and those are the stories I want to write. The person who should write yours is you. And the people to pitch stories to are editors and publishers, people who can actually hire you to write the stories you want to tell, and publish them once you have. They’re who I pitch stories to, and they’re who any writer needs to pitch stories to. In the second place, I’m not the guy to pitch stories to because, like many other writers, I avoid reading or hearing unsold stories for legal reasons. As I said, I’ve got lots of my own ideas, and I don’t want to run the risk of having someone think I swiped their idea. If I’ve had a story idea in my files for twenty years, and someone pitches me a story that’s sorta like it, what do I do? Do I scrap my story idea for fear someone will think I stole it from them? I don’t want to have to do that, so it’s safer all around to just avoid reading unsold stories. Sorry not to be more accommodating, but I hope you have very good luck in developing your story into something you can write yourself—and sell to a publisher. So, Kurt, when’re you gonna give us some more Dreambound? It was such a bizarre little group that I loved it. Plus, I really want to know how Swashbuckler got the slash on his neck? And how in the heck a dead guy dreaming can be resurrected? P.S. Some Tomorrow Woman would be good, too. I did work up a Dreambound mini-series, in the wake of Trinity, Pat, but it was—as you might expect—a very odd project. It was far more a fantasy series about these super-powered oddballs who were trying to find a way to make their dreams come true, and not really very superhero-y at all. As such, the artist I wanted to draw it wasn’t interested, because there wasn’t enough action, and I wasn’t that interested in doing it without him. Plus, while I think something like that might have worked at Vertigo, I suspect at DC proper it would have had disappointing sales. I tried coming up with other ways to make it work—at one point working up a whole intertwined set of mini-series featuring the Dreambound, Tomorrow Woman, Konvikt, Vartox, Intergang, the Odd Man, Live Wire, Commander Steel and more, and at another turned it into a freakish superhero series called The Odd Men—but while it turned into a superhero project that could have been really fun, it wasn’t what I really wanted to do with the Dreambound, which was that quirky little fantasy series about making your hopes and dreams come true. Plus, it never really gelled into something that I thought would last long enough to tell the story I wanted to tell. As for Swashbuckler, all I’ll say is that he was buried near San Francisco, and he has that scar on his neck because he “died” by being beheaded. That ought to be enough to figure out who he was. Or was intended to be, at least. You never know, with comics. This entry was posted in Mail and tagged astro city, breaking in, dreambound, power company, superman: secret identity, trinity by Kurt Busiek. Bookmark the permalink.